This week in our series, Maurice Joyce and Frank Oliver continue the story of the man who served as America's twenty-second and twenty-fourth president, Grover Cleveland. FRANK OLIVER: Grover Cleveland began his second presidency in eighteen ninety-three. His two terms were separated by the presidency of Benjamin Harrison. Cleveland took office again just as the United States was entering an economic depression. Businesses failed. Banks closed their doors. Workers lost their jobs. And farmers lost their farms. President Cleveland believed the depression was caused by the government's money policy. At that time, both gold and silver were used to support the value of the American dollar. In Europe, however, only gold was used. American investors and bankers were afraid their money would drop in value because of the use of silver. They began exchanging their money for gold. President Cleveland wanted to return to the gold standard, too. To do this, he had to urge Congress to kill a law which forced the government to buy silver. Before Congress began its debate, the president discovered a cancer in his mouth. The cancer needed to be removed immediately. But the operation had to be kept secret. News that the president's life was in danger could have an effect on the debate. It could make the nation's economic crisis worse. MAURICE JOYCE: So, the operation was done on a private boat in New York Harbor. Doctors removed some of President Cleveland's teeth and much of his upper left jaw. Then they removed the cancer. The operation took only a half hour. After a few weeks, doctors made Cleveland a new jaw out of hard rubber. He wore it without difficulty. A newspaper printed a story about the operation. But administration officials denied it. The facts did not become public for many years. FRANK OLIVER: When President Cleveland returned to Washington, he sent a message to members of Congress. He urged them to kill the law which forced the government to buy silver. He noted how people throughout the nation had been exchanging their paper money and silver for gold. He said he was afraid the federal treasury would soon run out of gold. Then it would have only silver to support the dollar. If that happened, he said, the United States no longer could claim to be a major nation. President Cleveland said: "The people of the United States have a right to a money recognized as such on every exchange and in every market of the world. Their government has no right to injure them by financial experiments that are opposed to the policies of other nations." MAURICE JOYCE: After the president's message was read, the House of Representatives began its debate. A young congressman from Nebraska spoke in opposition to the president's position. His part in the debate made him famous throughout the nation. His name was William Jennings Bryan. Bryan said the United States should continue to make and use both gold and silver money. Using only gold, he said, increased the value of the dollar. And that made life difficult for America's farmers and workers. They had to pay more to borrow money. And, for farmers, a more valuable dollar meant lower prices for crops. Bryan described the situation this way: "On one side of the debate stand the business interests of the United States. On the other side stand the unnumbered masses. Work-worn and covered with dust, they make their appeal. But too often their cry for help has sounded hopelessly against the outer walls, while others -- less deserving -- find easy entrance to the halls of Congress. "The president is wrong to act on the demand of the business interests. He can no more judge the wishes of the great mass of our people by the words of these middlemen than he can measure the ocean's silent depths by the foam upon its waves." FRANK OLIVER: No other congressman spoke as well as William Jennings Bryan. Yet his words could not save the silver purchase law. The House of Representatives approved President Cleveland's proposal to kill the law. The Senate did, too. The United States was firmly on the gold standard. Everyone -- especially President Cleveland -- waited for the economy to improve. It did not. MAURICE JOYCE: More businesses failed. More workers lost their jobs. Tens of thousands of men left their homes to look for work. Some of these men began to unite in protest groups they called "industrial armies." One industrial army was organized by a man named Jacob Coxey. Coxey proposed that the federal government should hire unemployed men to build roads. He said the government could borrow enough money to pay each man a dollar and a half a day. Coxey decided to take his proposal to Washington. He also decided to take his industrial army with him. FRANK OLIVER: Coxey's army marched many kilometers from Ohio to Washington. Hundreds of unemployed men joined in along the way. But by the time the army reached the capital, only three hundred men remained. City officials barred Coxey's army from meeting on public property. They barred them from asking people for food or money. Jacob Coxey was ready for the worst. He said: "If my men starve in the streets of Washington, the smell of their bodies will force Congress to act." Coxey tried to read a protest statement at the Capitol building. Police stopped him. The protestors then pushed forward in what police later called a riot. Several of the men -- including Coxey -- were arrested. A judge found Coxey guilty of violating public property. He sent him to jail for twenty days. Without Coxey's leadership, his army broke up. Its members went home. Yet the economic and social pressures which created Coxey's army did not ease. Protests and strikes continued throughout the nation. MAURICE JOYCE: The biggest strike started in Chicago against the Pullman Company, which made railroad cars. The man who owned the company, George Pullman, also owned the town where his workers lived. He owned the stores, the houses, the schools, and the library. When the economic depression began in eighteen ninety-three, George Pullman cut the size of his work force. Those still working received less pay. Yet Pullman did not reduce the cost of rent for his houses. Anyone who protested lost his job. FRANK OLIVER: In the spring of eighteen ninety-four, a labor union organizer went to George Pullman's town. He was Eugene Debs, leader of the American Railway Union. Pullman did not want his workers to belong to a union. But he did not stop them at first. More than four thousand workers joined. Immediately, the new union members voted to go on strike against the Pullman company. Other members of the union supported them. They agreed not to work on trains that included Pullman cars. Within a few days, sixty thousand railway workers were on strike. Twenty railroads were closed down. Union leader Eugene Debs attempted to keep the strike peaceful. But he could not control strikers all over the country. So, railroad companies asked the federal government for troops to break the strike. MAURICE JOYCE: The request involved a legal point. America's constitution says federal troops cannot be sent to a state unless the state government asks for them. And no state government had asked for them. President Cleveland met with his cabinet to discuss the railroad companies' request. 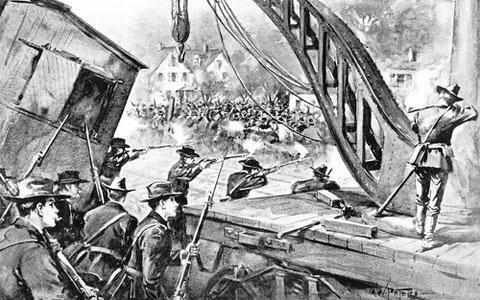 They finally agreed to send federal troops to Chicago -- where the strike had started -- to enforce federal postal laws. The troops would protect trains carrying mail. The arrival of the troops led to more violence. Eugene Debs and other leaders of the American Railway Union were arrested. The Pullman strike ended. FRANK OLIVER: President Cleveland faced increasing political problems. Organized labor denounced him for using federal troops to break up the Pullman strike. Farmers and westerners attacked him for opposing the use of silver money. And everyone blamed him for not doing more to end the depression. These political problems would have a great effect on the next presidential election. STEVE EMBER: Our program was written by Frank Beardsley. The narrators were Maurice Joyce and Frank Oliver. You can find our series online with transcripts, MP3s, podcasts and images at www.unsv.com. You can also follow us on Facebook and Twitter at VOA Learning English. Join us again next week for THE MAKING OF A NATION -- an American history series in VOA Special English.